Monsoon, piping hot food and good books, are all synonymous. 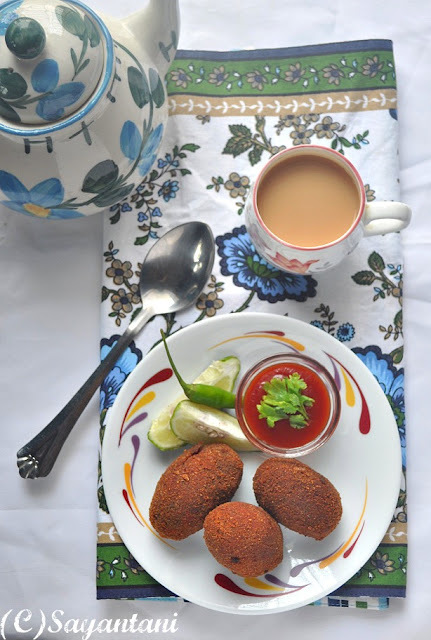 Nothing else makes Monsoon as enjoyable as some freshly made masala tea and some spicy fritters. Its that time of the year when we all want to be home and enjoy the shower and the weather in our cosy corners. The recipe that I am going to share today fits this picture perfectly without being too heavy in terms of spices and oil. 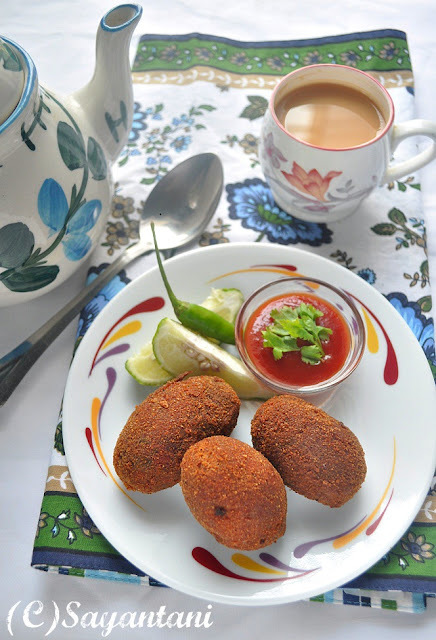 So if you are looking for something guiltfree and healthy to serve along with the evening cuppa to your family, then this could be your answer. 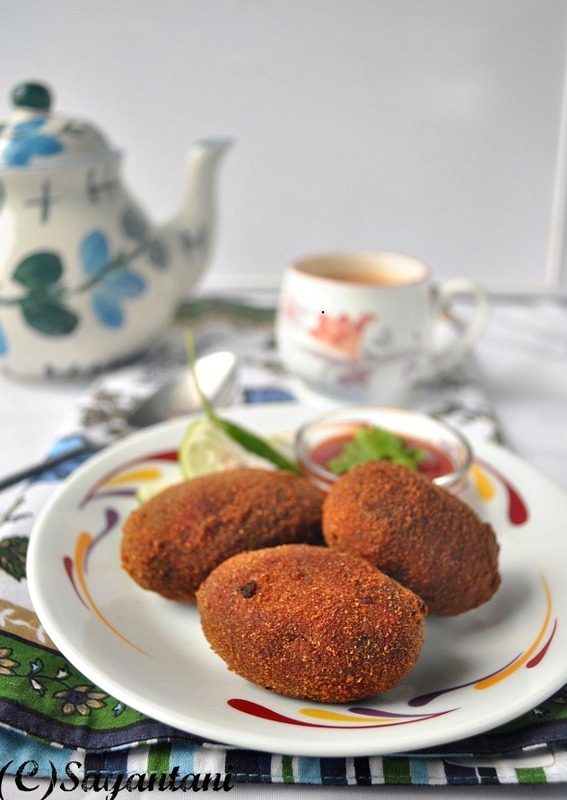 Vegetable chop is a very popular snack all over Bengal and mostly were a winter affair. But now that beets and carrots are available the year around they have suddenly become omnipresent. Go to any parar cha er dokan or misti’r dokan (local tea shop or sweet shop) you will get this pure vegetarian variety (no onion garlic) of these chops. When we were growing up eating out was not much popular atleast not in our small town. And we hardly had any shop seling quality food. There were some Mishti’r Dokan but they hardly sold anything savory. We have always seen Maa making something for bikeler jolkhabar which could loosely be translated to after school snack. She is an avid cook and tried various types of dishes. Chowmein, chops, telebhaja (dep fries), idli dhokla were quite common for us. For some strange reason I always liked the homemade version of these chop more than its store bought counterparts. And now when my son needs to carry a snack box to school these are made quite often at home too. A healthy and surely tasty way of enjoying vegetables. I make it a point to prepare these in large quantities, make the chops and fredge them in air tight containers or under plastic wrap. With these stashed in the fridge entertaining sudden guests is so hassle free. between for weight watchers here's my baked veg and soy chop that I made with leftover boiled vegetables from soup stock. Wash the potatoes and cut in half. peel and cut the beet and carrot in ½” cubes. Place everything in a pressure cooker with 1 cup water and salt. Cook on medium for 1 whistle. Let the steam dissipate in itself. Open the lid and still warm peel the potatoes and mash with a potato masher or with the back of a flat bottom bowl. Mash till smooth. Cover and keep aside. In another bowl mash the vegetables along with the peas. Let it be coarse so that we get little bite in the chops. Keep aside. While the veggies were boiling lets make the bhaja masala. Dry roast them on low heat till they are dark and toasty. Do not burn them, try to stir continuously. Powder this in the dry grinding jar. Keep aside. In the same pan dry roast the peanuts on very low flame till they are nutty and toasty. Remove and crush lightly in mortar and pestle. If you get skinned and halved nuts use that. Heat 2 tsp oil and add the panchforom and chopped chillies. Once they start to splutter add the grated ginger or paste along with a pinch of salt which will prevent it from stickig to the pan. Once you get the nice aroma add the mashed vegetables. Mix and adjust seasoning. Keep on cooking till the extra juice of the veggies are cooked and the mash looks dry(approx. 3-4 minutes). Add the potato and mix thotoughly. Adjust the salt and cook for a minute. Remove from heat and once it cools down a bit add the bhaja masala, raisins (which would swell by now) and nuts. Mix thoroughly. Now take a handful of this mixture and press between your palms and make oblong shaped chops. Repeat with the rest of the mixture. Now make a thin batter with the corn flour and 1/3 cup water. Dip the chops in it to moisten the outside which will help the breadcrumbs to stcik easily. Sread the crumbs on a flat plate and roll the moistened chops on it. Be sure you are covering all its side including the side tips. Place on a buttered paper. If not frying right away save them in a flat fridge safe box. . If you plan to place chops one on another place a butter paper in between. Its always better to fridge them for an hour. To fry just heat enough oil to immerse the chops and bring it to smoking hot. Decrease the flame to medium low and fry them in small batches till they are golden brown on the sides. Remove with a slotted spoon and place on absorbent paper. Serve hot with sauce or ketchup or any dip of your choice. In shops they generally serve it with thinly sliced salad of cucumber and onion. you can also add little pieces of coconut. cut in real small bits and add to the pan just after frying the panchforon. cook for a minute on low and then proceed. sometimes I also dip them in lightly beaten egg rather than corn flour batter. I do this mainly when need to carry the fried chops for a picnic or so. even for sons snack box this works well as the crust becomes thicker and stronger. if you plan to serve them at home just follow the corn flour batter. you can also add fried cashews, chopped corianders or other vegetables like cauliflower etc. To JCO-Monsoon of India. Originally started by Jagruti and this edition hosted by me. Kids Delight Warm food to beat the rain, hosted at the Pumpking farm. 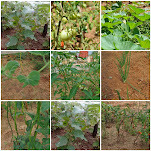 vegetable chop recipe, Indian vegetable cutlet, cutlet recipe, veg cutlet, recipe for cutler, vegetable cutlets, bengali cutlet recipe, begali bhegetable chop recipe, chop recipes, how to make vegetable chop, no onion garlic recipe, pure veg chop recipe, no onion no garlic chop recipe, evening snack recipe, indian snack recipe, bengali deep fried vegetable chop recipes.recipe vegetable cutlet, bestever chop recipe, kids favourite snack recipe, idea for snack box, easy snack recipes. so tempting clicks!! !loved this healthy and guilt free chop recipe..
Fatafati..Jibhe jol eshe gelo...Sob kichu ki sundor kore sajiyecho...Aar chaa tao dekhe darun hoyeche bojha jachhe ! 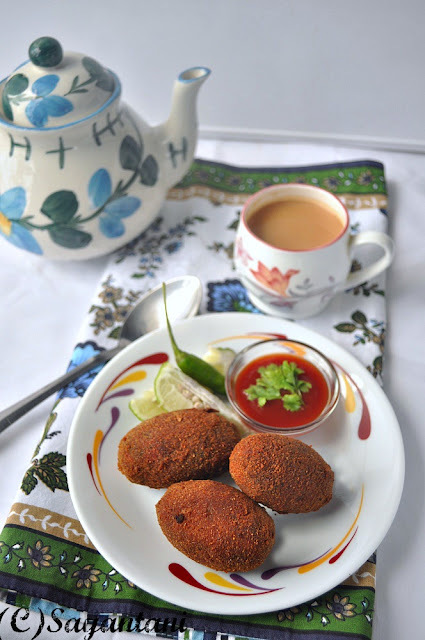 oh..these egg shaped chop looks flawless, crunchy and perfect!! love the pics! Awesome clicks !! as usual nice presentation !!! Super crispy and irresistible chops, an inviting snacks. I just love these chops..tempted very much 2 grab one..
Me too made on the same process. Perfect one Sayantani. Very tempting click. Delicious vegetable chops. I love the color, awesome clicks. Wonderful post Sayantani..Loved reading you.and the chops,they look terrific..Cheers ! These chops remind me of my childhood indeed. Thanks for reminding these. Haven't taken part in any event for ages. Will see if I can send an entry here. I'm coming over your house right now! They look really scrumptious. Lovely clicks! Perfeeect looks so yummy and tempting,clicks are superb dear..totally love the recipe. Perfectly made chops....would have tasted great in that rainy season , as u say. looks delicious dear. Chops look perfect and very tempting...yumm.. This speaks in volumes of the lovely Kolkata food. Your clicks are so amazing .. feel like picking them straight from the pics and devouring. Yummity yum..making the same to enjoy with my evening cuppa.. I really like the startup. True words. Happened to read the detail post of spices now. Very useful and added to fav. BTW vegetable chops are very tempting. These look delicious. Not sure how it is guilt free though. But who cares? Tomar chop gulo darun dekhte hoyeche..Vegetable chop r recipe khujte giye tomar ta pelam..Size gulo-o besh boro mone hochhe..Tumi joto ta amount likhecho, tar theke kota chop hoye, bolte parbe ki? 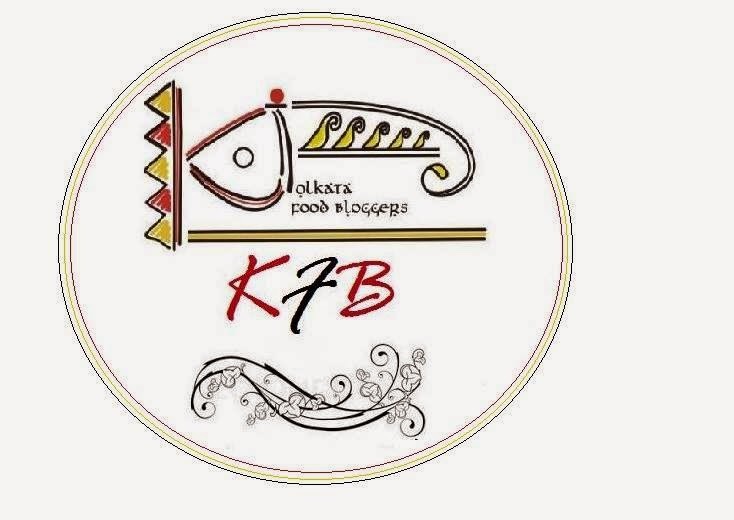 Maane dhoro 10-12 jon loker jonyo jodi kori, tahole koto ta nite hobe sob kichu, mainly sobji gulo? 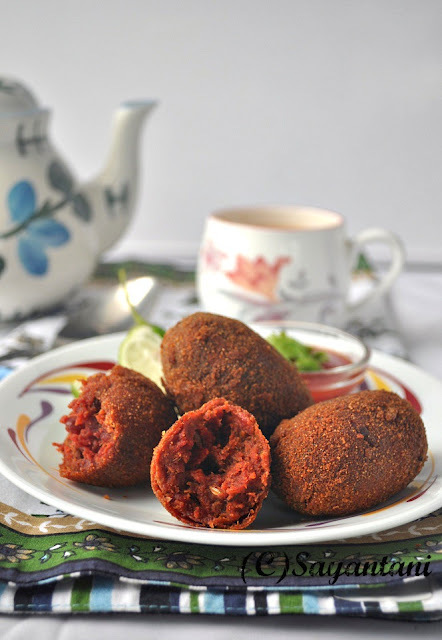 Aar tumi likhecho je egulo freeze kora jaye batter e dip korbar pore. Tumi ki deep freezer e rakho naki emni refrigerator e? Deep freezer e na rekhe jodi emni fridge e rakhi, tahole kotodin thakbe bhalo? Onek dhonyobaad ei darun recipe ta-r jonyo. 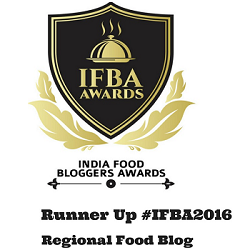 @Sulagna, The qty have mentioned here is good enough for 12-14 medium size chops. If you are planning to serve one piece to each then I guess this much would be enough. Otherwise you can multiply the qty with 1.5. like 6 potatoes 3 beetroots and so on...you can fridge it (not freezer) for 1-2 days but in that case do not use egg as dip. make sure your containers are air tight.